Klaus Sattler, a professor at UH Mānoa's Department of Physics and Astronomy, has edited the first reference book to cover the field of carbon nanomaterials in a comprehensive fashion, reflecting its interdisciplinary nature that brings together physics, chemistry, materials science, molecular biology, engineering and medicine. 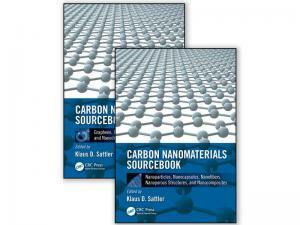 The two-volume Carbon Nanomaterials Sourcebook contains 1,324 pages and 799 illustrations in 53 chapters. The scope of the book spans from fundamental properties, growth mechanisms, and processing of nanocarbons to electronic device, energy storage, biomedical and environmental applications. It encompasses a wide range of areas from science to engineering. As well as addressing the latest advances, the sourcebook is written in a unique hybrid tutorial/science style and presents core knowledge with basic mathematical equations, tables and graphs. It provides the reader with the tools necessary to understand current and future technology developments. The book may be used by professors for new course development, by students for an introduction to this fascinating field, and by researchers as a reference. It is timely because of the strong current interest in this area and because of the extraordinary prospects for the future. Sattler’s research group at UH Mānoa currently focuses on the synthesis and fundamental studies of carbon nanofoam, new ultra-light carbon allotropes built by a complex three-dimensional graphene scaffold. Carbon has been known since ancient times in the form of soot, charcoal, graphite and diamonds. It also forms the key component for all known life on Earth. It is in nearly every biological compound that makes up all plants and our bodies. It is often assumed in astrobiology that if life exists somewhere else in the universe, it will also be carbon based. Out of the 118 elements on the periodic table, carbon is arguably the best at bonding. No other element is capable of forming molecules as large and complex as carbon-based molecules. What makes carbon even more unique that it can bond with other carbon atoms to create long carbon chains and rings, which allows for the formation of DNA. The backbone of such large carbon molecules consists of carbon-carbon structures in the nanometer (one-billionth of a meter) size range. Such low-dimensional all-carbon nanostructures have attracted significant attention in the last three decades. Carbon nanomaterials have unique electronic, optical, thermal, mechanical and chemical properties. In particular, carbon nanotubes, fullerenes, nanodiamonds and mesoporous carbon nanostructures became new classes of materials. Fluorescent carbon quantum dots may be used for staining tumor cells and for nanomedical therapy. Research of graphene, a single sheet of graphite, is one of the fastest growing fields today and holds the promise of someday replacing silicon in computers and electronic devices. Electrons in graphene move nearly with the speed of light, and graphene-based computers would function with super-high speed. Many scientists and engineers today are redirecting their work toward carbon nanomaterials. Immense research interest has recently focused on the production of new carbon nanomaterials with specific functions. From high-performance supercapacitors and flexible electronics, hydrogen storage and solar cell sensitizing, to cancer diagnostics and targeted drug delivery, the exceptional properties of such carbon nanomaterials can lead to many applications with major implications for our future society.